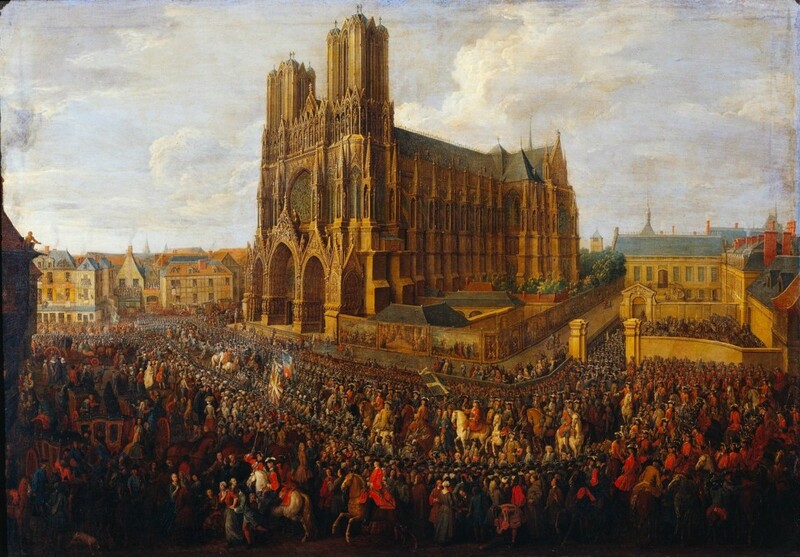 After a childhood marked by the death of his father, the political troubles of the kingdom, the authority of his Spanish mother, the paternal presence of an Italian minister worthy heir of Machiavelli, but also hunger, cold and civil war, June 7, 1654 Louis Dieudonné de Bourbon is crowned king of France in the cathedral of Reims. Reims becomes for a few days the center of the kingdom that is rebuilt around the young king of 16 years. The ceremonial is impressive as a theatrical performance: the cathedral of Reims is decorated with tapestries, carpets, tribunes, and a throne on the rood screen; all the great men of the French kingdom, but also the sovereigns of Europe are present and from dawn installed in their place. All had in mind this Royal Ballet of the Night, in February 1653, whose unheard-of splendor had consecrated “the greatest king of the world” in the spirits. At this symbolic and profane coronation, responds now this true coronation before God: the golds, the machines and the costumes leave room for the staging of the throne, the sumptuous crown, the ermine, the scepter and the hand of justice, the processions of the elite of the kingdom, accompanied by flocks of bells and oboe ringtones. If there is no indication of what music was specifically played on this occasion, we can trace through a meticulous investigation a large number of clues: the course of the ceremony, the sung texts, the various music bodies present, the mobilized instruments, the number of performers, their location in the cathedral and the types of music. Today, with the precious help of the musicologist Thomas Leconte, we propose a coronation of Louis XIV in a musical form, opening the ears of the music lover of the 21st century to the treasures of polyphonies of the past.